The Welsh secretary will meet Hitachi bosses in Japan next week to discuss suspended plans for a new £13bn nuclear plant in Anglesey, the BBC understands. The company has blamed rising costs and problems with a funding formula for halting the Wylfa Newydd project. 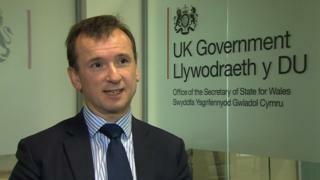 Alun Cairns will try to encourage Hitachi to work on a financial package that allows it to resume the scheme. During the three-day trip he is expected to meet a number of Japanese firms with interests around Wales. What's Wylfa and why is it important? It was being developed by Hitachi's Horizon subsidiary. Mr Cairns told MPs earlier this week he was "optimistic" the project could go ahead if a new funding model was agreed.